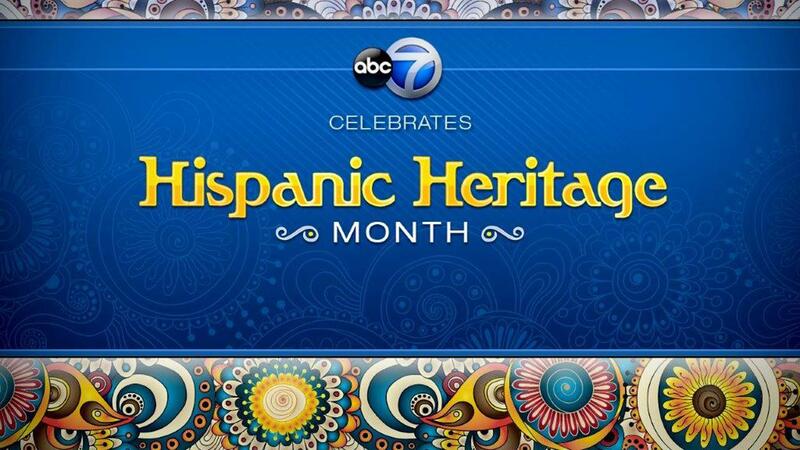 CHICAGO (WLS) -- ABC 7 CHICAGO will highlight the rich culture and traditions of Chicago's Hispanic community during Hispanic Heritage Month, September 15-October 15. ABC 7 will celebrate Chicago's diverse community with special news reports; the broadcast of the The 26th Street Mexican Independence Day Parade; a half-hour edition of THE Ñ BEAT; and a series of vignettes. The 26th Street Mexican Independence Day Parade, sponsored by the Little Village Chamber of Commerce, was hosted by ABC7's Stacey Baca and Cesareo Moreno, chief curator of the National Museum of Mexican Art. ABC7's parade broadcast, in the heart of the Little Village neighborhood, illuminates Mexican culture and is considered one of the most colorful parades in Chicago. More than 200,000 spectators were treated to mariachi bands and floats including the ABC7 Chicago float, where members of the ABC7 Eyewitness News team - Tanja Babich, Rob Elgas, Michelle Gallardo, John Garcia, Leah Hope, Will Jones and Roz Varon - rode and greeted those watching along the parade route. This year's Grand Marshal was Juan Valentin. Born in Guadalajara, Mexico, Valentin has recorded dozens of albums and has received five Grammy nominations. He has also appeared in many movies in Mexico. Currently, Valentin is touring the USA as an ambassador of mariachi music throughout the world. Throughout September and October, ABC7 will celebrate Hispanic Heritage Month with vignettes spotlighting some of the influential and talented artists and business persons who will be featured in the upcoming September 24th edition of THE Ñ BEAT. The Ñ Beat is an Emmy-award winning ABC7 show that turns the spotlight on Chicago's vibrant Latino community. ABC7 will broadcast its Emmy Award-winning program, THE Ñ BEAT, hosted by Stacey Baca, with special contributions by ABC 7's Tanja Babich, Rob Elgas, Michelle Gallardo, John Garcia, and Roz Varon, Sunday, September 24 at 11 PM, with an encore presentation on Sunday, October 1, at 4:30 PM. Rachel Castro was just 17 when she suffered a massive stroke at her after-school job. Her determination through tough physical, occupational and speech therapies yielded results and she was able to get her life back. Rachel talks openly about her harrowing ordeal and how she's using this second chance to speak out about stroke warning signs and symptoms. As a neuroscience major at the University of Illinois at Chicago, she has selected a career path to help people like herself. She even has aspirations of attending medical school. Funded by the National Museum of Mexican Art, this year Yollocalli is celebrating 20 years of mentorship. Through this youth initiative, young adults receive instruction in all forms of art, from mosaics to murals. They even have their own radio station where kids hone their broadcasting skills. THE Ñ BEAT checks out all Yollocalli has to offer. Next THE Ñ BEAT catches up with Sandee Kastrul who co-founded the non-profit I.C. Stars to help train inner-city adults for technology careers and community leadership. Using project-based learning and full immersion teaching, I.C. Stars provides opportunities for change-driven, future leaders to develop skills in business and technology. Next up, she knows her way around a kitchen because she has worked in her parents' Taqueria since she was 10. But now she is the Executive Chef and owner of Mi Tocaya Antojeria in Chicago's Logan Square. Her culinary talents have earned rave reviews from Chicago food critics and the moniker, "Mexican Marvel." Diana Davila Boldin shares her story of success, her Mexican heritage, and the special dishes she serves up from her first restaurant, Tocaya Antojeria. The Ñ Beat and The 26th Street Mexican Independence Day Parade will be available on-demand at www.abc7chicago.com. Cathy Karp is the producer of the parade. Rubye Wilson and Holly Grisham are the producers of THE Ñ BEAT.